I remember at the beginning of the year, making a whole load of New Years drawing resolutions. I then proceeded to draw loads of shoes. Even though that hadn't been one of the resolutions. I had a big old shoe binge (or should that be purge? ), for about a month and half. It seems that I have one of those every six months. It's totally unintentional. I'm not that obsessed with shoes. I like them, yes, but I don't spend most of my day thinking about them. Despite what you may see on this blog. It's made me think about it. Why? Why shoes? Why do so many people like shoes so much? 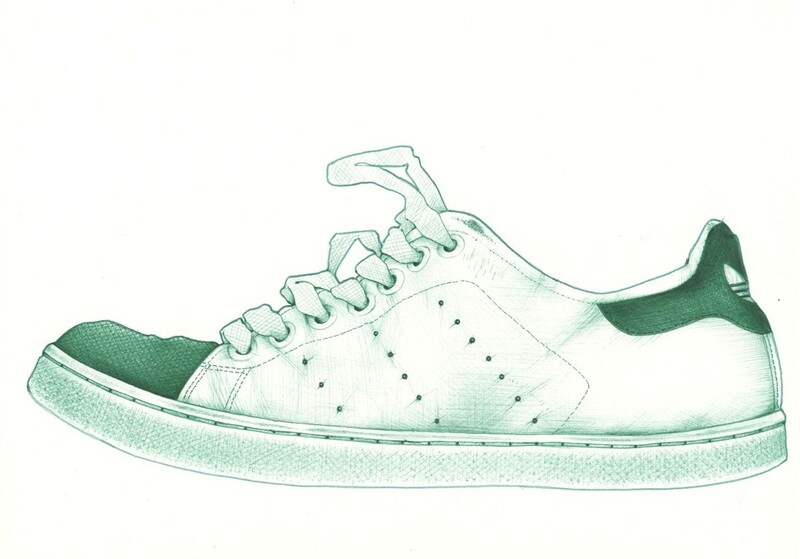 Anyway, here's another drawing of a Stan Smith. It belongs to Josh, who has a thing for Adidas trainers. So it's not just a girl thing. Well, here's the thing - your drawings bring shoes to life! If this weren't true, you probably wouldn't draw shoes. And whenever I see your drawings of shoes, I am blown away and I love shoes too! I always like your shoe drawings. And there's no end to the variety. I am a big fan of adidas classics shoes, and everytime you do one of those, I get so excited ^^ This is a beautiful one, and I loveeeee green! Shoes are very human thing, they reflect our movement through life. I love them, too. And your lines are perfect! You do them so beautifully, so why question?!! Thank you so much, folks. I'm very happy with this and the last drawing of these trainers. A cpouple of my personal faves, I think. Glad you like 'em too. I had a pair of those adidas shoes, they were the best shoes I ever owned. Good rendition of them.